Posted by Krzysztof Zbiciński on 2018-10-02. Unfortunately the world is not ideal and browsers have different event loop implementations. This article describes the mechanism basing on Chrome’s V8 behaviour. Description of differences across the browsers deserves a separate article ;). Let have a detailed look at each of the elements. log(message); // logs "Hello justjoin.it! It's  2018-06-16T08:25:06.641Z!" Web APIs - additional interfaces provided by the browser, which the engine can make use of. The next element is the task queue - this is where all of the function calls, that were passed as callbacks to the asynchronous methods of the Web API belong to. Nothing can be taken from this queue until the call stack is empty. In another words, not a single callback will be handled until there is any function being executed at the moment. This rule explains behaviour standing behind the setTimeout(fn, 0) “trick”. The fn function will be simply executed as soon as the browser becomes idle. 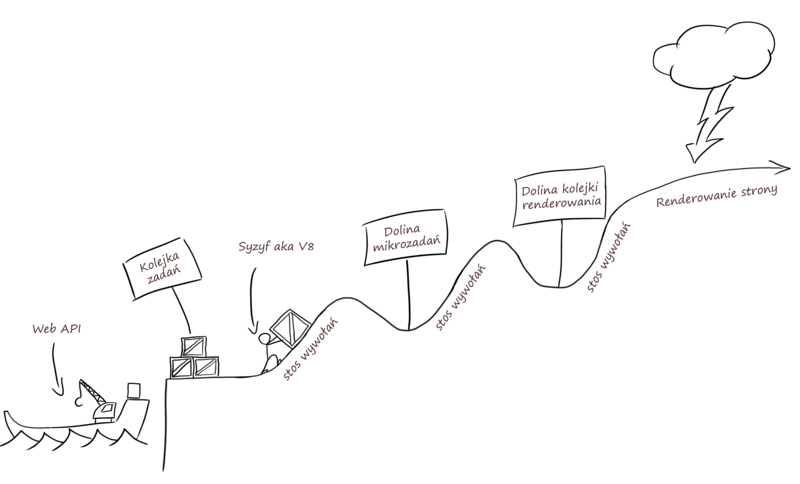 The task queue works according to the FIFO principle (First In First Out), therefore the earlier the element was put in the queue, the sooner it will be handled. Until taking a single element from the queue, event loop proceeds to the call stack and then, to the next queue - the microtask queue, which will be covered a bit later. So with each “cycle” of the loop, only a single task from the task queue can be handled. Despite the fact, that the API can return a response before the long synchronous operation finishes, the logResponse function execution have to wait until the call stack becomes empty, even if it takes a lot of time. In order to simplify things a bit, we can simulate an instant HTTP request using the setTimeout function with a delay equal to 0, which causes the callback to be placed in the task queue almost immediately. prepareMessageTimeout('justjoin.it', log); // 2. logs "Hello justjoin.it! It's 2018-06-16T08:25:06.641Z! log('End'); // 1. logs "End"
Another mechanisms that use this queue include MutationObserver, setImmediate and process.nextTick which is available in Node.js. In order to give a smooth experience, the browser has to refresh webpages about 60 times per second. A render queue contains tasks, that will be performed before the next render of the page occurs. If we want to place a piece of code there (e.g. in order to recalculate position of an object) we need to use the requestAnimationFrame function. The render queue is being processed until it becomes empty - the same as the microtask queue. console.log('End'); // 1. logs "End"
If there is something in the task queue, pick the first element and put it on the call stack. Process the call stack until it becomes empty. Process the microtask queue until it becomes empty. Process instructions coming from requestAnimationFrame, recalculate styles, render the page. Metaphorical representation of the Event Loop. Author: Filip Smulski. 1. What is going to appear in the console? // What is going to appear in the console? Why? MutationObserver uses the microtask queue, which is not being handled until the call stack becomes empty. Assigning the value of 2 to the variable foo will occur before the onChange callback will be executed. 2. What will be the order of the messages? // What will be the order of the messages? Why? 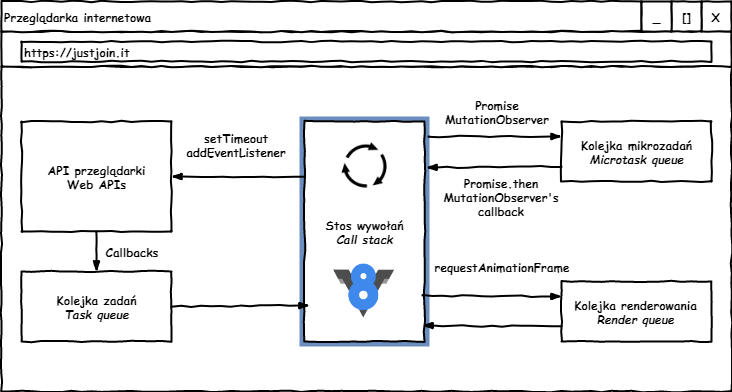 After processing the whole call stack, the microtask queue is being handled (which is used by promises), then the render queue (which is used by requestAnimationFrame) and only after that, a task from the task queue (used by setTimeout) can be picked up. As a result, the messages will be presented in the reversed order. 3. What will be the order of the messages after clicking the button? // What will be the order of the messages after clicking the button? Answer: click1, promise1, click2, promise2. Why? There are two functions being attached to the click event of the button. Their executions will be placed in the task queue one after another. In the next loop cycle, only the click1 function will be picked from the queue. As a result, the function logging promise1 will be placed in the microtask queue, which will be processed right after the call stack becomes empty. Only after the microtask queue becomes empty, the onClick2 function call can be picked from the task queue and handled accordingly. 3a. What will be the order of the messages after clicking the button? Answer: click1, click2, promise1, promise2. Wait… Why? Contrary to the previous example, onClick1 and onClick2 functions will be executed in a synchronous manner, therefore they both will be placed in the call stack immediately instead of “going through the task queue” first.